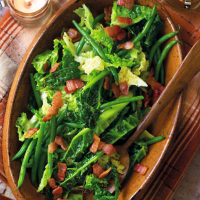 Cabbage is rich in vitamin C. Even though we've added crisp bacon to the cabbage, this dish is low in fat. 1. Put the bacon in a large sauté pan and cook until golden brown. Add the caraway seeds and cook for 1 minute. 2. Add the cabbage, sprinkle with the stock and 250ml boiling water. Cover and cook for 10 minutes. 3. Add the beans, cover and cook for a further 5 minutes until all the vegetables are tender. This recipe was first published in September 2011.